This Crown yacht offer you many options. Yachting Playa del Carmen and riviera maya coastline for sightseeing, for fishing, relaxing or to snorkel at reef. Visit many inlets at the coast or do a trip to Playa del Carmen to see the skyline of the city Tours available for 4hrs 6hrs or 8 hrs. Chris Craft Crowne 340 express cruiser. V-BERTH features large transverse double berth with overhead opening hatch, three fixed ports, storage beneath berth, privacy curtain and flat screen. GALLEY is athwartships to port. Features large countertop, single sink with hot and cold pressure water, Kenyon non pressurized alcohol/electric stovetop, Norcold front loading refrigerator, overhead opening hatch, Tappan microwave, Black/Decker coffee maker, four drawers and ample storage. DINETTE is opposite galley. 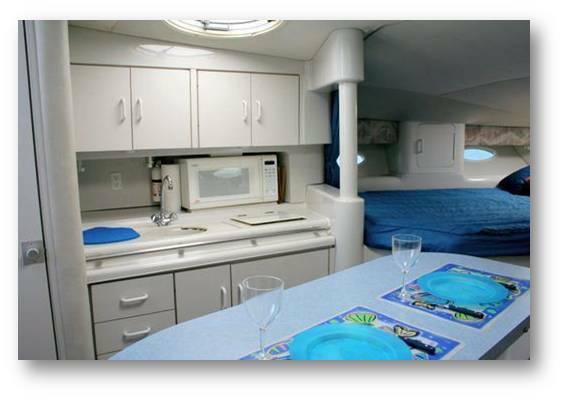 Features contoured settee outboard, long table, hanging locker, AC controls, shelves and ports boatboard. ENCLOSED HEAD is at the base of the companionway to port. Features PAR electric vacuum marine head, holding tank, holding tank alarm, sink with hot and cold pressure water, shower on wand, sump and mirror. 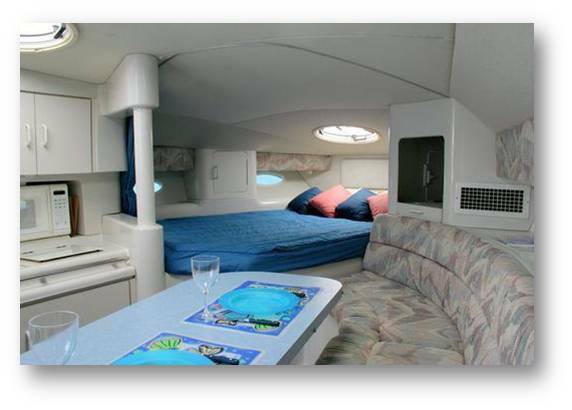 AFT BERTH is wraparound settee - converts to double berth. INTERIOR HIGHLIGHTS - reverse cycle heat and air, snap in canvas floor runners - fabrics and cabinetry in very good to excellent condition.